Have you ever seen Amy Cuddy’s Your Body Language Shapes Who You Are on TED? If not, go look it up. It is amazing. In summary, it is about how our body language affects how others, as well as we, see ourselves. The good news is, there is a thing called “power posing,” whereby standing in a posture of confidence, we can trick our brain’s testosterone and cortisol levels to believe we are confident. This is exactly the reason that Dancer's Pose, or Natarajasana, is so powerful and an important peak pose for your next practice. Dancer's Pose exudes confidence as well as stretches the shoulders, chest, thighs, groin, and abdominal muscles. It strengthens the legs and ankles. It improves balance and concentration. 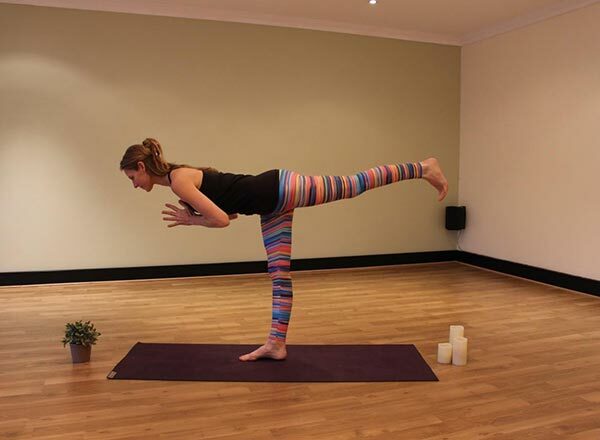 It stretches the hip flexors and strengthens the arch in the standing foot. It is a powerhouse of a posture packaged in a graceful dancer pose. While it should be avoided if you are experiencing low blood pressure or a shoulder or back injury, this is a great choice for a peak pose in a confident practice. First of all, a peak pose is a specific pose you are working toward and may be your inspiration for your practice. To build on your practice, as well as get the most out of your peak pose, it is important to start with a warm-up. Feel free to be creative. Maybe it is a few Sun Salutations A/B (Surya Namaskar), or your combination of movements. Some of my favorites include Low Lunge (Anjaneyasana) and Low Lunge twists (Parivrtta Sanchalasana). Additionally, I am a big fan of Standing Forward Folds (Uttanasana). After building some internal heat and moving through some of your personal favorite poses, to build a sequence around Dancer's Pose, it is important to prepare the body for success. Poses that are well suited to lead up to Dancer stretch or strengthen various aspects of the posture. For example, One-Legged King Pigeon Pose (Eka Pada Rajakapotasana) helps stretch the front of the body as well as stretch the back, while Monkey Pose (Hanumanasana) stretches the groin muscles. Upward Bow/Wheel (Urdhva Dhanurasana/Chakarasana) opens the heart and stretches the shoulders, which is helpful for reaching for the back foot. The Warrior series (Virabhadrasana I-III) are all great preparation poses to improve balance, strengthen the core, and learn how to press down through the feet while lifting the legs up toward the hips. Tree Pose (Vrksasana) is a great posture to help build the strength in the thighs, calves, ankles, and spine that is essential for Dancer. Additionally, Dancer's Pose is successful as a final pose after a series of challenging backbends. To do Dancer's Pose, start in Tadasana, feet together and arms by your side. Inhale and bend the right leg backward while the right arm reaches around the right ankle, either inside or outside depending on your shoulder flexibility (listen to your body!). The left hand reaches directly in front of your left shoulder. Slowly lift and tilt forward, keeping the right knee in the same plane, so if you were looking at a mirror you would eventually be able to see your right foot behind/over your head. Keep the supporting left leg engaged, while the inner thighs gravitate toward the midline of the body, left thigh reaches up toward the left hip, and left arm slowly lifts while keeping left shoulder down the spine. Send your drishti (gaze) slightly above the horizon. Come out of the movement slowly to defy gravity, utilizing the core muscles and improving concentration. You made it to the peak pose, so now is the time to cool down and maybe move closer to the floor. While you may have done some hip openers prior to Dancer's Pose, after the peak sometimes it is nice to repeat a pose from earlier in the practice and hold it for longer or move into a deeper variation. I like to move into hip openers like Pigeon Pose, and maybe transition them into Mermaid, King Pigeon, or Double Pigeon. This may also be a great time for inversions if you enjoy those in your practice. Lastly, enjoy a well-deserved Savasana. Do you have any tips to build a sequence around Dancer's Pose? Share them with the rest of the community in the comments below!